This is the ninth installment of: “Keep a 5 year Journal.” At midmonth, Tami shares her progress and the list of questions for the upcoming month. Click here to see all 12 months. We are on the home stretch of the hard part. You’ve chosen where you’re keeping your questions and have gotten nine months worth in your books. Now it’s time for you to do a little victory dance. 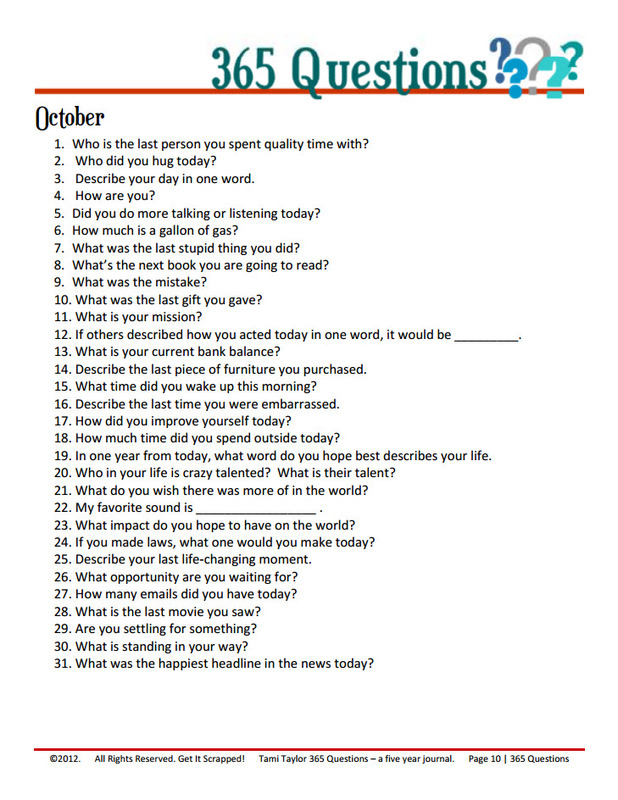 After just three months more, you will only need a few seconds a day to answer the questions you’ve set up through this year. And then get you’ll get to the fun stuff: comparing your answers to the previous year. Thinking of that finished project gets me excited and inspired to keep going. I hope you’re still keeping up and enjoying the journey. I cannot wait to check in with everyone periodically next year to see how your answers stack up. Thanks for another list of great questions. I’ve kept a journal since the beginning of August. I look forward to having the November prompts to be set up for them on November 1. I don’t remember if I posted before or not but I still plan to start in January. I’ve been saving all the PDF’s and have been trying to decide how I want to organize my journal. Any ideas? I actually finished the whole year!!! I am so proud of myself for completing the first year of the project. It’s all digital and I plan to add a new element/design to my page each year. Now that I’m done with the first year, the rest should be easy as pie. Thanks so much for the prompts!!! Can’t get October to pop up to print. What comes up is September. sorry – the text link was working but not the image link. NOW both work.